Here is a look at most of my projects from this year. It's kind of fun to see them all in one place! I'm looking ahead to several projects already started and plan to really finish up some things that are sitting in the UFO pile. A few may just be abandoned and that's okay, too. I hope to finish up even the things I don't love. 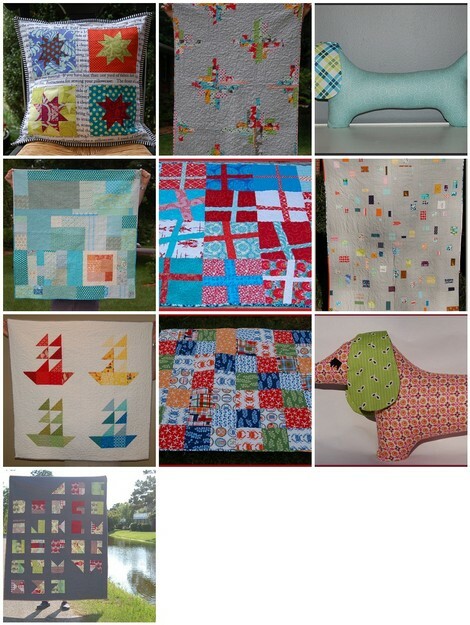 My quilt guild donates to a local charity and that's always a good cause. Whew! I'm tired just looking at that list! What about everyone else? What's your crafty plan for 2013? Wow great work! Good list for next year too! Paige, I love the modern style of your finishes. Have fun with your 2013 plan! Sounds like you'll be busy! You were VERY quilt productive this year. My goal for 2013 is to knit/stitch down the stash. This page contains a single entry from the blog posted on December 31, 2012 2:17 PM. The next post in this blog is A New Finish and a New Challenge.